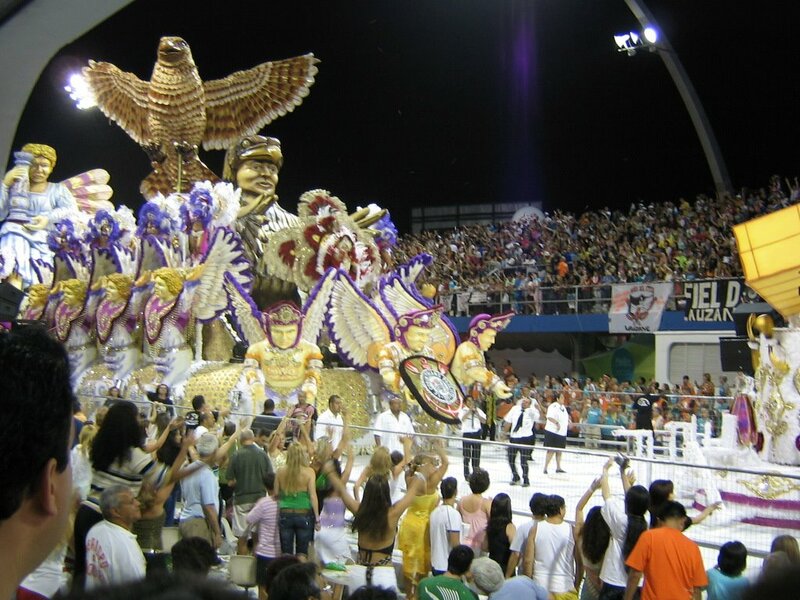 At last, the moment you've been waiting for: Carnaval! Carnaval turns out to be nothing like I expected. I figured it involved drinking yourself silly, making out with strangers, dancing in the streets - you know. Your basic bacchanalia. And I had a vague sense it was something that happened in Rio. Well, for starters, Carnaval is a holiday all over the country. (Unless you work for a newspaper, but more on that later.) Dancing in the streets? The all-night parade is actually on a half-mile course with stands for viewing. Making out with strangers? They're all about it in Salvador, but São Paulo is kind of famous for being boring. And drinking? There was some beer goin around, but that was about it. Brazilians are like the kids we heard about in lectures on underage drinking: they know how to have fun without alcohol! Or at least, not all that much alcohol. When Brasileiro told me the parade would go all night, I thought he was exaggerating. But we got there at about midnight, as the first group (picture above) was just getting underway, and when we left, at 7:30, the last group hadn't even started yet. Yes, my friends: 7:30 in the morning. It was broad freaking daylight. I was so freaking tired. I just found a pretty cool site - 43places.com - that allows you to track where you've been and what you (and others) think of those places. It's also affiliated with a slew of similar sites: 43things (for resolutions), 43people (sort of like friendster), and allconsuming (for books, movies, music, etc.). If you enter the places you've been and then click on 'Your X Places' a nifty map comes up. I thought TOWWAS, you would particularly enjoy it given your worldliness, but I'm finding it a fun procrastination tool as well. For anyone who would like to 'know' me, I can tell you my super-secret name...which TOWWAS now knows from my previous, now deleted, comment. Secret name - bwah hah ha ha hahhhh! That was an evil laugh. Did it sound evil? I'm not sure it sounded evil. Well, it was evil, ok? Gosh!